Just a little eye candy for you this evening -- some shots of my latest obsession. Frankly, I'm smitten. What good would a pretty stranded knitting shot be without a shot of the guts? 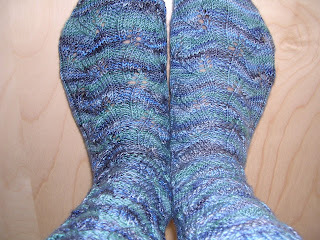 Finished: Black Socks of DOOM! Do not adjust your monitor -- these are indeed the most boring socks ever. 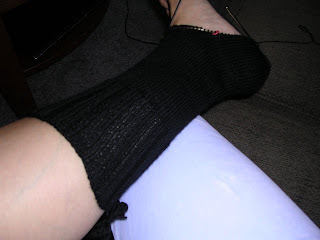 They are black and they are stockinette, and they took freaking FOREVER to knit. But the recipient will love them. I'm not sure there's much to say about this pattern, as I've knit it so many times before. It's my go-to stockinette pattern for J, so he gets a lot of them. Normally I'm not one to mind long stretches of stockinette but knitting these was almost interminable for one simple reason: I hated the yarn. It was rough and scratchy and snagged on itself. I know it will soften up with a couple of washings, but for now I'm extremely glad to be done with knitting it -- and it's now officially all out of my stash (I'd bought four skeins of it back when Pittsburgh Knit & Bead was going out of business). Look, it's not black! He'll occasionally let me knit him a non-black or non-gray sock; usually red is the default other color. 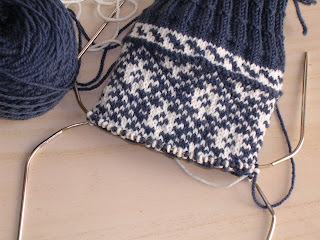 As I've already knit him a pair of Plain Winter Socks in an almost identical shade, I had to find another simple yet easily distinguishable pattern. I settled on a simple garter rib worked over 68 stitches. Just enough variation from stockinette or a basic rib to not drive me batty, but simple enough that I won't mess it up as a result of nerves this week. The socks I really wanted to cast on for are the ones in the August STR shipment, but I was too lazy to get out my swift and ball winder to wind the yarn. 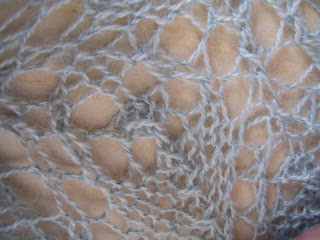 I did, however, photograph the gorgeous skein; the photo is now in my Flickr stream, for those of you who want to peek. 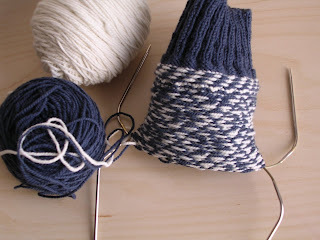 This is a great little pattern and one I will definitely be using again. 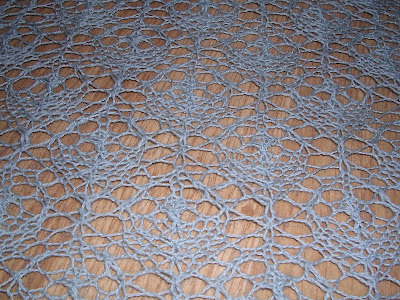 I found it through the wonders of Ravelry, which is really an incredible resource for finding pattern ideas. (Those of you still waiting to get in will be well rewarded for your wait!) Many who have knit this pattern commented that there were a lot of ends to weave in for such a small knit, and I certainly found this to be the case: I had no fewer than six ends to weave in for each bootee. 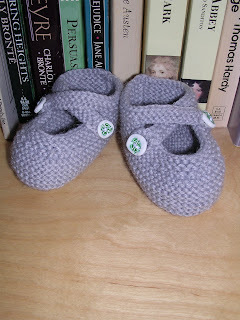 But I used two of those on each to seam up the back and sole and one on each strap to make the button loop. The cuteness factor makes it completely worth it in the end. Because I chose such a plain, neutral color for the knitting, I decided to jazz these up a bit with some handmade polymer clay buttons. I am thinking of going out and buying some Fimo just to make some more that are the right size. 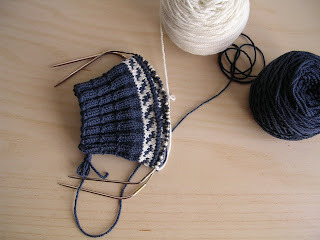 On the night in between knitting the two bootees, I swatched for my Central Park Hoodie and for J's Seamless Hybrid. The latter was really the easier endeavor, as I was more swatching to get a fabric I (and J) liked instead of a proscribed stitch gauge. I did a square with sections knit with a US 7, a US 6, and a US5; we both decided we like the fabric best with a US 5, which works out best with the math anyway as it gives me a gauge of about five stitches per inch. The CPH swatch was more critical. 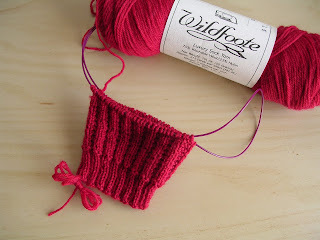 Although I'd swapped out yarns (Cascade 220 Tweed), I did this first swatch with the recommended US 8 needle. Right off the needles it didn't measure up, but I diligently washed it and lay it out to block overnight. 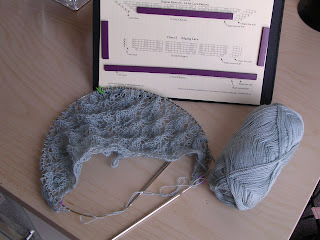 When I measured the dried swatch, I had a moment of utter shock: my gauge was spot-on perfect -- and not only stitch gauge but row gauge as well! We'll see if this swatch turns out to be a dirty little liar, but for now I'm diving in head first with the recommended needles. The wedding is now a little more than a week away, so as it gets closer I expect more and more frantic and stressed, so don't be surprised if I'm not blogging as regularly as I normally do (or at all, for that matter). I am sure I will still be knitting -- I'll need to, if only to keep my sanity -- but I highly doubt I'll be accomplishing anything of note fiber-wise. I will be doing my best to keep up to date on your blogs, so don't be surprised if I'm leaving you comments at odd times (again, gotta do what I can to keep myself from a nervous breakdown!). ETA: At least one thing I don't have to stress about this week is chasing the mail carrier for my August STR package -- it came on Thursday! And it is GOR-geous! I won't post any spoilers here, but if you want to see it, I'm sure you can find it easily enough. Thank you for all of your compliments on the shawl! I am really very pleased with how it turned out. I will of course endeavor to get a decent shot of me wearing it, in my wedding dress, on my wedding day, although here's hoping I won't actually need to use it for warmth. 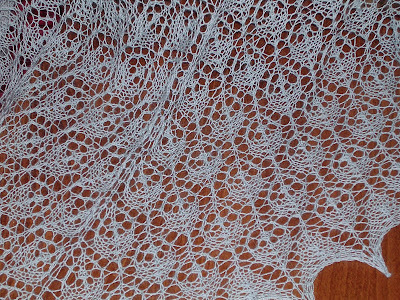 The FBS reignited in me my addiction to lace, and I had no sooner finished pinning it out and leaving it to dry then I pulled out yarn, needles, and charts and cast on for Icarus. Unfortunately I must tell you that what you see here is the second attempt. After completing the first full repeat of the first chart, I discovered a weak spot in the yarn several rows back -- and by weak spot I mean that it was hanging on by a few fibers and was ready to snap altogether at any moment. At that point I thought it easier to just cut the yarn and start over than tink back and have to weave in more ends. The yarn is Ornaghi Filati Merino Oro, called a laceweight but I think technically it'd be classified as a cobweb weight or at very least a fine laceweight. I'm knitting on size US 3 needles. I'm not feeling any real urgency to knit this shawl, not having set a deadline for myself (although wouldn't it be nice to have for our honeymoon cruise? ), so I'm knitting for a bit and then knitting for a bit on other projects. I don't have an intended recipient, nor do I have immediate plans to knit the mate, but it was a fun diversion. 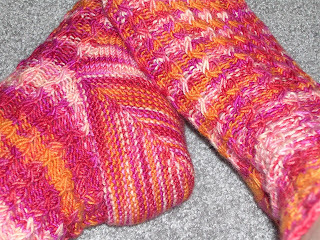 Plus, it used up some acrylic-blend stash yarn for which I had no other use. Tonight's plan is to knit some swatches. With the weather being so unseasonal and the wedding only 12 days away(! ), sweaters have been on my mind. There are at least two I am planning to knit this fall: Jenn and I are doing a mini-knitalong of the Central Park Hoodie, and I would like to knit J a Seamless Hybrid for Hannukah this year. Plus, there's also the Tangled Yoke Cardigan, whose yarn was my big splurge at the Yarns by Design anniversary sale, but I am happy to push that a little further down the queue for the time being as I think I may need to acquire some longer circular needles for it. Okay, maybe there's three sweaters I want to knit. And don't even get me started on the socks! In the end, I was concerned about running out of yarn, so I did a total of 16 repeats of the main body chart in addition to the edging charts. 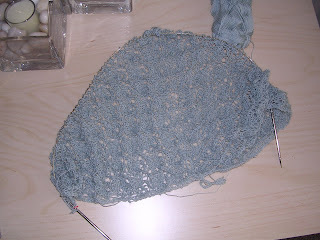 I then blocked this shawl severely, restretching it several times. For the first time, I used blocking wires to hold all the points along the side, and I'm quite pleased with the results. So, my wedding knitting is now done -- and for the record, the shawl was finished two weeks before the wedding, and I didn't stop knitting socks in the interim. 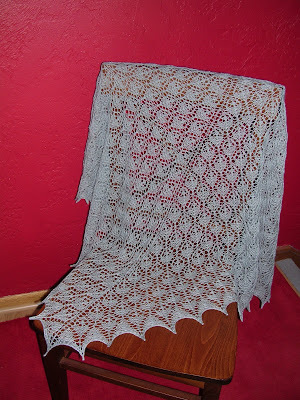 I'll leave you with some other shots of the shawl, with my apologies for the lack of natural light. We had a perfect day yesterday, but today it's overcast and rainy, so I was forced to take only indoor shots. Enjoy! Today I am home sick with some sort of stomach bug, which, as the Hurricane Knitters will tell you, was bothering me last night. This morning when I woke up still feeling icky, I decided that I'd rather stay home than spend the whole day at work running back and forth to the bathroom (which is no easy feat these days, as the restrooms on our floor are closed for remodeling so we're forced to go to a different floor). I haven't taken a sick day since last fall, so I think they can survive a day without me. I'm beginning to worry that my yarn supply won't hold out for the 18 repeats I was shooting for, especially considering the edging is another 12 rows past the main chart repeats, so I may be ending this earlier than I thought. Last night's meeting of the Hurricane Knitters, in spite of my stomach issues, was a lot of fun. We had another good crowd with most of the regulars. Julia was back, as was Lynn, and we were joined by a newcomer, Joyce. Marybeth finished her very first project, an adorable garter stitch hat -- she even mastered seaming garter stitch to sew it up! It looks quite fetching on the lava lamp, no? It's actually quite cute; I couldn't believe Jen made it herself! 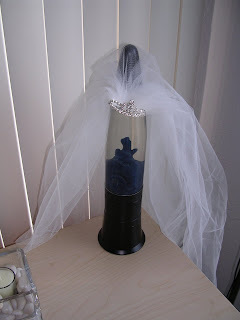 She insisted I bring it home with me, just in case I have a veil emergency on the day of the wedding. Before I pull out the shawl and get down to business, I do want to give you a peek at a WIP I started last weekend but haven't mentioned. I'm afraid it's rather boring. Can you guess who this sock is for? 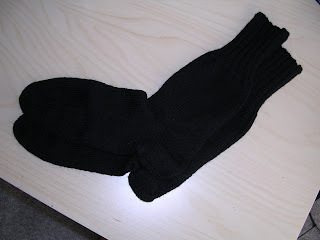 This is my usual pattern (Gentleman's Plain Winter Sock from Knitting Vintage Socks) in very boring black Fortissima Socka. I'm not enjoying the yarn; it's very scratchy and rough, and it's drying out my fingertips. But the pattern is so easy and fast that I can't complain that much. These socks fall solidly in the category of long-term planning, as they'll be a holiday gift for J. I know it's only August, but I have several sweaters I want to knit this fall, so in my opinion it's not at all too early to start my holiday knitting! Sorry about the extreme whiteness of my leg -- there's a reason I'm wearing a long gown to my wedding! This was a quick, relatively easy, satisfying knit. Aside from the lace pattern, it's all in stockinette, so it rolled as you would expect. 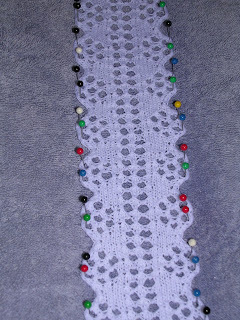 To get the pretty lace to stay open, I soaked it for several minutes in some water (with just a little Woolite to get it nice and clean) and used lots of pins to block it on a towel -- one pin per outer eyelet, plus a couple at the end. Then, I sprayed the whole thing a few times with some spray starch. It seems to have worked perfectly; it's holding its shape, but it's not too stiff. For finishing, I used two lengths of 1/4" blue ribbon through the center eyelets and threaded some thin elastic on the inside. It's not especially grabby or tight, which is both good and bad. On the one hand, it won't cut off my circulation; on the other, it may not stay up, so I may have to excuse myself a few minutes before the garter toss to sneak it on. The shawl continues, although it hasn't seen too much action in the past day (I had to pay full attention to the movie I started watching last night to know what was going on). It will be coming with me to knit night tomorrow, however, so I hope to see you there! I'm pretending I don't really care, although I'm going to wash the darker sock a few times to see if it'll lighten a bit so that the difference won't be nearly as obvious. 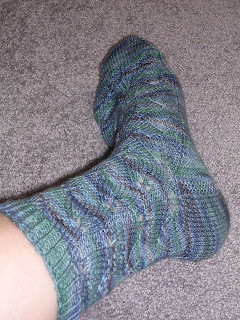 This was the third pair of Embossed Leaves I've knit, and I think I'm done with this pattern for the time being. I still love it, especially how fast it knits up, but I'm pretty sure I could knit this pattern in my sleep now and I'm ready for something a little different. Guess what else is done and is blocking? That there is my garter, knit in crochet cotton. I washed it, pinned it, and sprayed it with a little starch so it will hold its shape. Once it's dry, I'll sew it together and put in the blue ribbon and elastic so I can give you a truly final report. Knitting on the shawl continues (and I've spared you another picture because it looks much the same as it did the last time you saw it, only larger). I'm now in the middle of my 13th repeat of the main chart; I made it through approximately 11.5 repeats with my partial skein, which leads me to believe the pattern vastly overestimates the yardage needed for this shawl. For laceweight yarn, it specifies 750 yards for a small shawl (12 main chart repeats) and 1200 yards for the large shawl (17 repeats). I had nearly enough for the small shawl with a skein that was less than the 437 yarns it would have been had it been complete. I'm now much more hopeful that I'll have enough yarn for 18 repeats (18 being a significant number in Judaism, so therefore quite appropriate and symbolic for my wedding). Now that I have power again, I'm off to catch up on my e-mailing and blog reading. Hope you've had a good weekend! 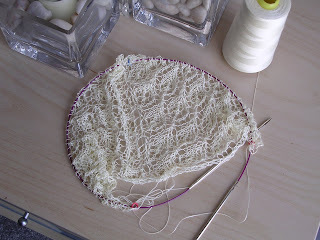 My, wedding shawl, how you've grown! Here we are after roughly 7.5 repeats of the main chart (the pattern tells me I need 12 repeats for the small shawl and 17 for the large; at this point I'm shooting for large, but depending upon how long the yarn holds out I may wind up with something in between). 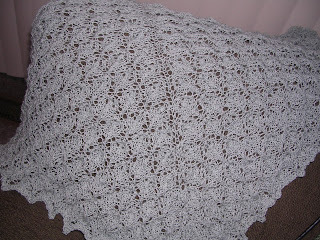 The pattern is Evelyn Clark's Flower Basket Shawl. I'm using the Fiber Trends version of the pattern, rather than the Interweave Knits version, because it gives instructions for three sizes and four weights of yarn. I was willing to shell out a few bucks for all these options. The yarn is Misti Alpaca laceweight (100% baby alpaca) in colorway 7120, which they call Sea Mist and which looks decidedly blue on the Web (and apparently in my pictures as well), but which looks green to me in person. 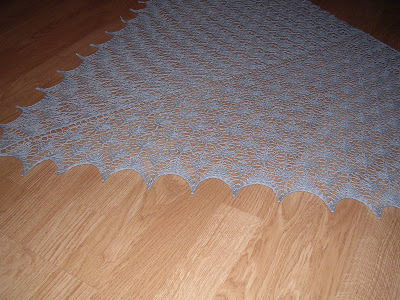 I had nearly two full skeins left over from this shawl that I knit more than a year ago. I started with the partially used up skein and have plenty left at this point. I'm sure this will probably shock most of you, but I'm using US 5 (3.75 mm) Addi Turbos to knit this -- NON-LACE Addi Turbos. As there are no extreme acrobatics with this pattern (the most complicated stitch is probably a sl 1, k2tog, psso), I'm doing just fine with the "Stumpos." 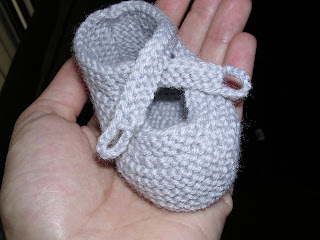 When it comes time to knit some nupps, however, I think I'll have to splurge for some pointier tips. I'd been knitting very slowly to get to this point, in part because knitting with this "yarn" is kind of like playing with a Chinese finger trap; the more I pushed it to try to get to get the stitches to move along the needle, the more resistant it became, and as soon as I relaxed, the stitches were liable to slip right off the needles. In fact, that's exactly what did happen. 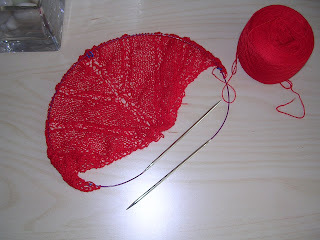 In the middle of a row, as I took my right hand off the needle to wrap the yarn around to make a stitch, the right needle slipped completely out of the stitches and about five of them fell off the needle. I tried to grab them, but somehow I missed a couple and could not seem to get that area of the pattern fixed correctly. At that moment I realized that this yarn was not worth fighting with -- I'm anxious about the wedding as it is without this added anxiety! I was ready to admit defeat. And it's just as well, because this yarn was knitting up too yellow for my taste. Don't think this is the end of the wedding shawl, however! I still wanted to get one done for the wedding, but I decided to go with another yarn in my stash that I've worked with before -- Misti Alpaca Lace (I used it first for this shawl and had nearly two complete skeins left). Since we were up anyway -- J had to be on a work conference call at midnight -- I cast on shortly before 11 last night and managed to get through all the set-up rows. Finally lace knitting felt familiar and easy again. I could see what I was doing, if a stitch slipped off it didn't drop down into previous rows (thank you, alpaca halo! ), and I was able to watch TV and talk to J without losing my place. 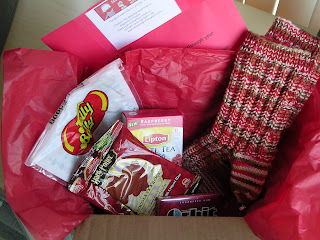 The socks I'll get to in a second; the package also contained a lovely note from my pal, Dawn; Dr. Pepper-flavored Jelly Bellys; instant raspberry iced tea packets; cinnamint gum; and some Harry Potter chocolate frogs. Mmm! And so incredibly cushy! I'm not sure what pattern they are (Dawn, can you enlighten me? 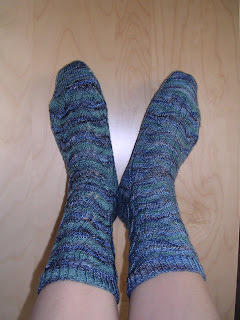 ), but they're a nice stretchy rib and will be so cozy to wear in the winter. Thank you so much, Dawn! 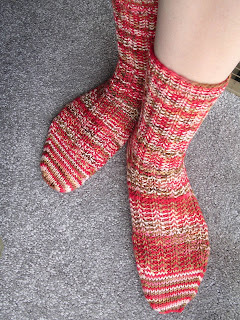 I decided to knit these toe up, although directions were given for cuff down, because I was worried about running out of yarn trying to cover the whole of my enormous feet. This was probably a good move, even though I did have a little bit of yarn leftover; I would have been too nervous the whole time had I knit them the opposite direction. although on both socks I got a little gap on one side of the heel after completing all the short rows (did anyone else have this problem?). 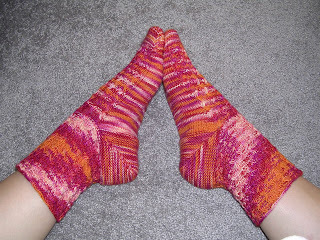 Of all the sock patterns I've received thus far for the sock club, this is the first one I'd knit again. And now that I know that one skein will successfully knit a pair of socks to fit my feet, I can knit the next pair cuff down! I finished this at lunch today and promptly cast on for its mate. I'm noticing, however, that despite the fact that the two skeins are the same colorway, they are clearly from different dyelots. The new sock is noticeably -- to me, anyway -- darker than the original. I wonder if I leave it in the sun for a couple days if it'll fade? 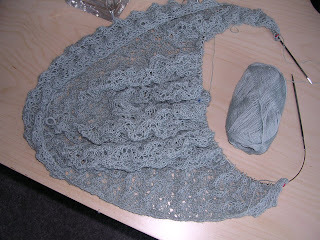 I have been working on the shawl; I have about 1.5 repeats of the main chart complete. I'll be working on the shawl in the evenings and on the weekend, when I have time to pay it the attention it deserves and get some serious knitting done. Come to think of it, what am I doing typing? I should be knitting lace!